When does your family spend time together disconnected from technology and other distractions? When have you enjoyed the pleasure of your own company? Can you remember the last time you had a heartfelt moment with a friend? When have you paused and been truly grateful? Have you seen a sunset lately, felt the wind on your cheeks, and listened to the rain? What's a magical moment in your life? "It is not often that I find a book that raises the awareness of the human spirit. From the very first story I found myself connecting, questioning and fully engrossed in each and every experience. What a wonderful read. If you are looking for a reason to celebrate life’s unique moments this is a must read for you. 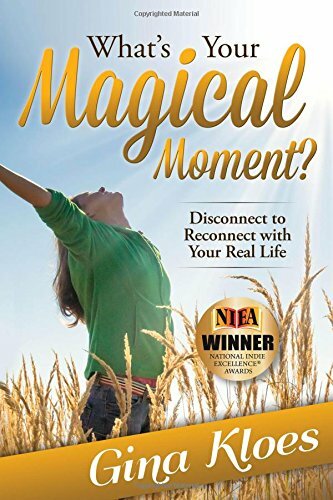 I am sure that I will revisit my copy of Magical Moments often so I may experience and relive my favorite stories and all the emotions each adventure creates." It is easy to lose track of what’s really important. - Chris K.
"The mindfulness movement is a relatively new trend for HR professionals. Corporations, especially those with resources, have been investing in mindfulness training classes in order to help improve productivity and employee well being. "Being present" in order to achieve focus and improve work related results is the desired corporate outcome. Ideally this practice is regularly reinforced in the work environment, establishing a routine. However, I've found it difficult to bring mindfulness to family life. Combine a busy travel schedule with a multitude of family commitments and electronic devices permeating the house, it is easy to lose track of what's really important. The stories and messages contained in this book are fun to read. The book's format is conducive to picking up at different chapters/stories. Most importantly the stories inspire me to take the habits I've developed at work and apply them to family life." "Thanks for inspiring, teaching and sharing. This is a beautiful compilation of "magical moments" stories by which we can learn and grow from. I have to admit that much of the book brought me to tears of joy, sadness, and reflection. We will be implementing this into our daily lives. Thank you for inspiring, teaching and sharing! Anyone can benefit by the teachings of this book and I highly recommend it and will be spreading the word with all my family and friends...I'll definitely be using this one as a gift this year for the holidays for sure!" "In these busy times, filled with the constant barrage of technology and the need to always be "connected" it is so easy to forget what is truly important. This book reminds us to slow down and take the time to cherish those magical moments, memories, and people who matter the most in our lives. I loved the ideas to reconnect the entire family and be present in the immediate moments - good, bad, happy or challenging - all can teach us life lessons for the future. I feel like I am looking at life thru new eyes as I take the time to savor the many magical moments the world has to offer!" "Thank you. I LOVE this book................. I couldn't stop reading ......... The stories are full of little reminders of the importance of life, love, friendships and many simple things that give us so much joy. The insights and suggestions from Gina are wonderful and help put thoughts into activities which will allow us to take many more magical moments (as I am now sure that there are many that happen around us that we haven't noticed as we are often too busy to acknowledge them!). I love that you took the time to get contributions, give insights and write this book. I will be recommending to many as I believe the messages re so important and will make a difference to the quality of so many lives." "I have only had the opportunity to peruse the contents of Gina's new book and am anxiously awaiting its arrival. But have been privileged to have ACTUALLY shared in Magical Moments first hand over the years with Gina and her family and I can tell you it has always been such an enriching life experience. She reminds us all ...young and old...how important and powerful it is to take time to reflect and share special life moments with each other. This is such a simple concept, yet I feel it gets so lost in our fast paced go-getter, hurry up, high tech, text and graphic communication world!! Focusing inward and then connecting with family, friends, coworkers using the magical moments framework can help you deepen your awareness of what is truly meaningful....and taking the time to relax, breathe, focus on the important moments that helped you to learn or appreciate something or someone, experience joy, feel compassion etc.. Magical Moments can help each one of us increase positivity and feel more peaceful...I find This practice nourishing and healing to my soul. I can't wait to read the entire book and can add to my review comments. Yet knowing and being inspired by Gina for the past 15 years, I can highly recommend her as a thoughtful, insightful, nurturing, positive, encouraging, enlightening, peaceful and educational influence without reservation. Magical moments can help you appreciate the moments that make up your extraordinary unique life journey!!"